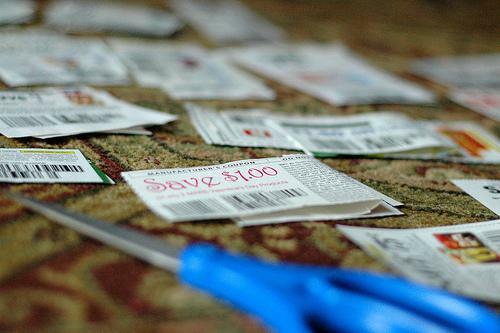 With the rise of smartphones, there’s no reason for moms to spend hours clipping coupons, sorting them by expiration date, and presenting an entire pile of coupons at check-out. Today’s mom wheels through the store with a list of what she needs and a handful of apps that rack up the discounts. There are so many options that it’s hard to decide which grocery coupons are the best. Check out this list of the top five apps that you should try on your phone. This app works with grocery stores like Walmart, Publix, Albertsons, and Winn-Dixie, but offers rebates on many other non-grocery establishments. You can even save at stores like Best Buy and KFC if you keep an eye out for good deals. After you buy, scan your receipt and unlock different items to receive rebates. For example, the app might give you $2 back if you buy chips and salsa around Cinco de Mayo, or buy champagne around New Year’s Eve. Ibotta also allows you to team up with friends for extra savings. Once you save $20, you can redeem your cash back for gift cards or money in your PayPal account. Consumer Reports says Grocery IQ is ideal for list makers who tend to buy the same thing every week. If you always pick up bananas for a snack or if the kids like a certain juice box, you can easily add the items to your list, and the app will search for coupons that are applicable to those items. You can also share lists, sort items by aisle, and scan bar codes as you go for extra savings. This app comes from Coupons.com, so you’ll be able to tap into their massive database to make sure you’re getting as much savings as your can. Cellfire is using the popularity of loyalty cards to help consumers save more money. You sync your loyalty cards to this app, and it sends clipped coupons to them when you check out. This allows you to clip coupons on your own time, and you only have to hand over one card at checkout — not 20 different coupons. If you enable notifications, you’ll receive alerts for potential savings when you enter a store so you don’t miss a great deal. This app is available for ShopRite, Kroger and more stores. The Grocery Smarts Coupon Shopper app is free, which means you can quickly download it to your smartphone, such as T-Mobile’s iPhone 7 Plus, and go shopping. This app knows that moms want to make the most of their coupons and don’t want to leave any money on the table, so it discovers ways to double down on savings, from the store circulars to national offers, so customers can pull savings from multiple locations. It’s accepted at stores like CVS, Wal-Mart, Walgreens, Target, and more. Instead of worrying about getting the best offer in this store, use this app to score better savings. Like Ibotta, Upromise combines the power of coupons with cash back, but this app specifically lets you save for college or pay off your student loans. If you save $5 every week on groceries through this app, then you can save $250 per year, or $4,000 by the time your child turns 18. A little savings adds up. This is also a great app for college students, who can work on paying off their student loans just by grocery shopping and visiting the mall. The Upromise app works on Apple and Android devices. One drawback is that Upromise requires more personal information to register than other coupon apps, which often let you use an email or Facebook account to register. Test a few of these apps until you decide which one is best for you. Some people don’t like the scanning aspect of Ibotta, while others avoid loyalty cards wherever they shop. Even the usability aspect of the app could be the deciding factor between using it every week and deleting it after a few days, so test several to learn which works best for you.